Owner Kurt Wolbrink�s interest in sayings, quotations, proverbs, maxims, epigrams and mottos began at a young age and originally involved collecting books (the kind printed on paper) and clippings. With the advent of the computer, but before the Internet, he created a database which has now grown to more than 16,000 citations. Originally, he only intended to save them for personal use he may have gotten a bit carried way. Over time, he observed how the right quotation used at the right time and place, could convey an important point in an unforgettable way, or sway someone�s point of view, or even motivate people to action. Kurt�s collection of quotations along with a passion for typography and a fascination with woodcarving (born of a distant relative/master carver whose chest of wood, carving tools and carvings were passed on to him) gave rise to the idea of carving "the world�s greatest thoughts" in an artful permanent form that helps preserve them for generations to come. The first step in developing a carving is to ensure the accuracy of its inscription. For verification, he makes every effort to go back as close to the source as possible. This can mean viewing an original document, a first edition publication or a reliable transcript. It also means he has had the great pleasure of working with a number of museum curators and historians as well as others who have specialized expertise or access. For items not originally published in English, he has gone back to the original language and engaged linguists to reaffirm an English translation. Kurt has also followed a similar path for the typography consulting vintage catalogs, scholarly works on typography, and experts in the field. From the delivery of rough lumber to the final finished product, the carving is done "Under One Roof". This production philosophy helps ensure the highest quality results by providing both flexibility and control over each step of the process while fostering a real sense of pride and accomplishment in the final product. Kurt is a preservationist working to preserve great thoughts and historic letterforms as well as the skills to make something of lasting and outstanding quality here in America. It may seem to some like a step back in time, but in reality it�s applying the lessons of our past so we can move forward. A distinctive benefit of Wisdom in Wood carvings is that a portion of the proceeds from each work sold generates a contribution to a recognized charity in the category shown. #001 "Do unto others as your would have them do unto you." The concept may date as early as 1780 B.C. with the term "Golden Rule" emerging circa 1850 in both England and the United States. Letter style is William Morris, a preeminent English designer and printer of that time. A portion of the sales proceeds benefits programs for Food, Shelter & Hope. #008 "May you live all the days of your life." Irishman Jonathan Swift (1667-1745) is perhaps best known today as the author of Gulliver�s Travels. Appropriately executed with a beautiful 13th century Irish calligraphic letter style, this carving is based on a line from his book Polite Conversation in which it is used as a toast. A portion of the sales proceeds from this piece benefits Cancer Research programs. #015 "The Road Less Traveled..."
This carving is arguably Frost's most well known verse from one of his most famous poems. Carved in a 19th century American calligraphic letterform with subtle organic/art nouveau overtones paired with a beautiful "two roads diverged" ornamental detail. A portion of the proceeds from this piece benefits Educational programs. #020 "There is no place more delightful than one�s own fireside." Marcus Tullius Cicero's great thought was taken from his Epistles in the original Latin and translated for us into English. The famous message says it all about just how nice it is to be at home. In a William Morris letterform because of the relevance of the thought to the fireplace inglenook often found in Arts & Crafts homes. A portion of the sales proceeds from this piece benefits programs for Food, Shelter and Hope. #022 "Live in the Sunshine"
The full line from Emerson's poem, Merlins Song, reads: "Live in the sunshine, swim the sea, Drink the wild air's salubrity." The inspiration for the lettering dates back to the 1870�s. Considered to be one of the most popular American-designed display typefaces of the Victorian era, it includes the complementary flower corner ornaments in an old typography catalog of the same period. A portion of the sales proceeds from this piece benefits Environmental programs. #023 "This is the day which the LORD hath made; we will rejoice and be glad in it." Psalms 118:24 The lettering design is modeled after the work of William Morris, a preeminent English designer and printer of the 1800's. #025 "The ornament of a house is the friends who frequent it." #029 "KNOWLEDGE IS THE FOOD OF THE SOUL"
A line from Plato's Protagoras. As a student of Socrates, Plato was the teacher of Aristotle and is believed to have authored Protagoras after the death of Socrates in 489 BC. The design is in a very early letterform dating from around 100AD which was used to carve inscriptions in stone monuments and buildings. This lettering style is still used for this today. A portion of the sales proceeds from this piece benefits Educational programs. #032 "Messing About in Boats..."
A portion of the proceeds from this piece benefits Environmental programs. #036 "HOME IS WHERE THE HEART IS"
An attribution to Pliny the Elder. Lettering is inspired by Scottish designer and architect, Charles Rennie Mackintosh. The rose motif was found adorning the interior of one of his most famous architectural designs, Hill House. A portion of the sales proceeds from this piece benefits programs for Food, Shelter & Hope. #042 "THOREAU - IN WILDNESS"
"WALKING" is an essay Thoreau delivered as a lecturer more often than any others. He thought of it as one of his most important works and is regarded as such by those engaged in any environmental movement or organization. Carved in a universal font design style of William Morris. A portion of the sales proceeds from this piece will be made as a contribution to the National Parks Foundation. The rhyme has been found in a 1911 magazine but probably has an earlier usage. Eloquently captures the sentiment of the original American Arts & Crafts movement. The letterform is a Walter Crane design and the rose is circa 1913. This thought comes from Chapter 9 of Thoreau's 1854 "Walden". Inspired by the tranquility of summertime moments near a lake. The lettering is of American 1800's. #048 "MUIR - GREEN DEEP WOODS"
Suggests the restorative power of nature and wilderness. Muir had regained his health by enjoying the cool winds and crystal waters of California's mountains. Lettering is classic style William Morris. #049 "CHAUCER - THE CRAFT"
Found on the fireplace hood of Gustav Stickley's Home at Craftsman Farms. But research takes us back to Hippocrates who used it in his practice of medicine. Chaucer borrowed it in 1382 before Stickley in 1901 made it the motto of his magazine, "THE CRAFTSMAN". Lettering is 1896 Morris Kelmscott Press. #050 "MUIR - MOUNTAINS ARE CALLLING"
Perhaps John Muir's most famous words as penned to his sister in 1873. Again in a Morris Kelmscott Press letterstyle with the carving borrowed from Muir's papers housed at the University of the Pacific. #054 "Wine is Bottled Poetry"
A Stevenson quote from his 1884 book The Silverado Squatters, Chapter 3, Napa Wine. Carved in a Craftsman style using the quintessential Craftsman letterform and grape trellis motif. #055 "The Woods Are Lovely..."
American poet Robert Frost called his 1922 poem, Stopping by Woods on a Snowy Evening, his �best bid for remembrance�. Lettering is by the renowned English Designer, William Morris with the �leafy T� an interpretation of an illuminated design from his Kelmscott Chaucer. A portion of the proceeds benefits Environmental Programs. All carvings are made of �� hand-selected quarter-sawn white oak sourced from a family-owned and operated lumber mill founded in 1903. All the carvings are finished in either a light Classic Oak or a darker Heritage Oak (see examples below) and a final light sheen indoor varnish. A custom designed hanging kit is included with all carvings; there is also a center key slot should you choose that hanging method. An adjustable display easel is also available, see below to order. 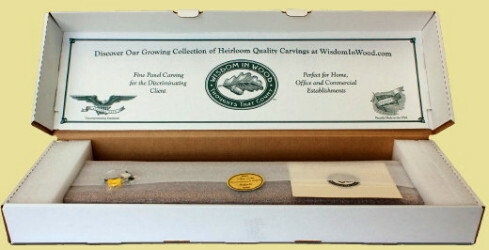 Here is a photo of the presentation box the carving is packed in; note it is perfect for gifting a Housewarming, at Graduation, Wedding, and Retirement. The carvings are heirloom quality meant to last for generations! The carvings are also available by special order in cherry, please ask for a photo sample. #020 "There is no place..."
#023 "This is the Day..."
#025 "...Ornament of a House..."
#029 "Knowledge is the Food..."
#050 "Muir - Mountains are Calling"